BGA stuffed Page quarterback Michael Magochy two inches short of the goal line on a two-point conversion to keep its undefeated season alive with an overtime win Friday. On Friday, the Battle Ground Academy Wildcats (5-0, 2-0) and Page Patriots (4-2, 2-0) reignited an old rivalry that hadn’t been played since 1988, and it’s clear the rivalry didn’t lose any excitement. Down eight with three minutes remaining in the ballgame, the Wildcats marched 80 yards for a score and converted a two-point try to send the game to overtime. They scored another touchdown to open OT, but Page answered with a score of their own. The Patriots tried for a two-point conversion for the win, but a mad scramble from senior quarterback Michael Magochy fell inches short and BGA escaped with a 28-27 win to keep its undefeated season alive. Page originally lined up to kick an extra point to tie the game and send it to the second overtime period. Senior Brent Cimaglia converted on the PAT, but a neutral zone infraction on BGA meant the play was called dead even though his kick was good. Page would have to try the PAT again, but this time the ball would be placed at the 1-yard line due to the BGA penalty. Head coach Charles Rathbone decided to go for two instead of the tie, but Magochy couldn’t find anyone open and came up just short of the end zone. It was the second time this season for Page that a decision to try for a two-point conversion instead of the tie on the last play of the game has turned around and bitten them. BGA got off to an early 13-0 lead in the first quarter, but Page answered with a 21-0 run that looked like it would stand until the last-minute scoring drive from the Wildcats in the fourth quarter. The BGA offense struggled after the first quarter until its last long drive of regulation. A major reason for that was two red zone interceptions thrown by senior quarterback Clay Beathard on back-to-back drives in the second quarter. 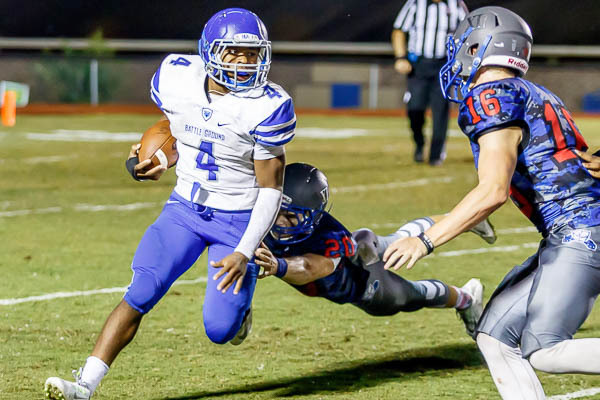 When BGA needed something big offensively, it seemed like freshman Jaylen Frierson was in the middle of it. He finished with 147 yards on seven catches and was the recipient of the overtime touchdown grab. Marcus Cawthorne added 58 yards and two touchdowns on five receptions. The Patriots went on their three-touchdown run thanks in large part to their rushing attack on offense. With rain falling early in the game and a soppy field, Rathbone chose to stick with a ground game based around Roberts. The senior finished with 120 yards and two scores on 31 carries, and also made an impact on defense, racking up 7 tackles and an interception. “I have great backups,” he said. “I have faith in people behind me, so when I say I need a break I know they are going to come in and execute and we’re still going to gain the yards that we need. Magochy managed 173 passing yards and completed 13-of-21 throws. With the win, BGA maintains its undefeated season going into next week’s Division II-A East/Middle Region contest against Davidson Academy (4-1). Page gets back into Region 4-4A action at home next week against Tullahoma (0-6, 0-2).